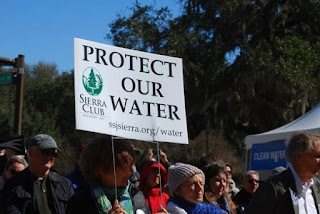 In April, 2015, Sierra Club Florida filed an emergency petition with the federal Environmental Protection Agency (EPA) seeking designation of the Floridan Aquifer as a Sole Source Aquifer (SSA) under the EPA’s Sole Source Aquifer Protection Program. The emergency petition would protect Florida’s drinking water and put a roadblock to building of the pipeline. On November 21st, 2014 Sabal Trail filed an application for a Certificate of Public Convenience and Necessity with the Federal Energy Regulatory Commission (FERC), the lead agency reviewing the proposed project. On September 3, 2015, FERC issued a Draft Environmental Impact Statement to assess the potential environmental effects of the pipeline (Update: Final EIS released 12/18/15. 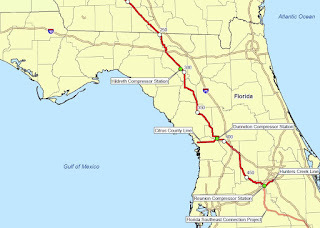 Sierra Club Florida, in partnership with the Alabama and Georgia Chapters, and represented by Green Law, submitted joint comments to FERC in opposition to the proposed pipeline. In October, EPA wrote a 30 page letter to FERC, stating it had “very significant concerns” about the proposed route of the Sabal Trail Pipeline and the impact it will have on wetlands. Further, EPA cited the Sierra Club petition for SSA in is comments and strongly recommended an alternative route for the pipeline to avoid impacts to the Floridan Aquifer. 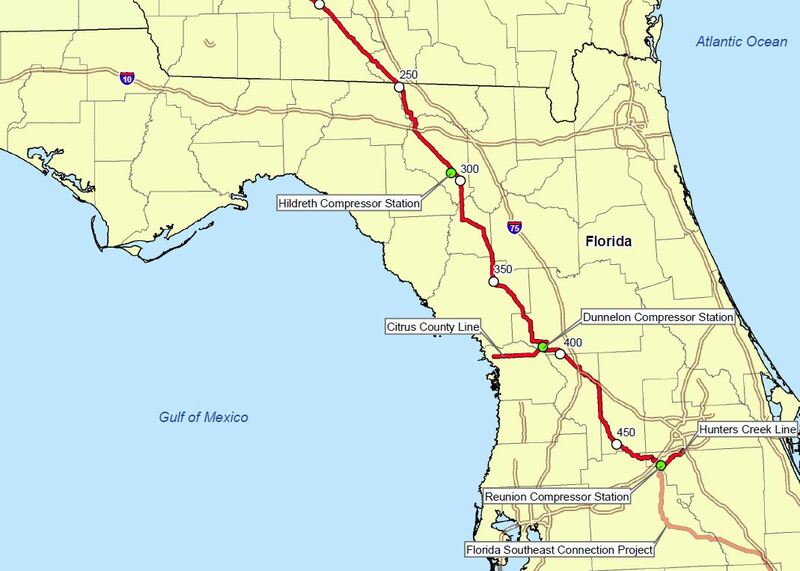 FERC must issue a permit before the Sabal Trail Pipeline can be built. They are expected to issue their final ruling in March, 2016. The Sunshine State is currently one of only four states that prohibits citizens from being able to purchase electricity from anyone other than a utility. 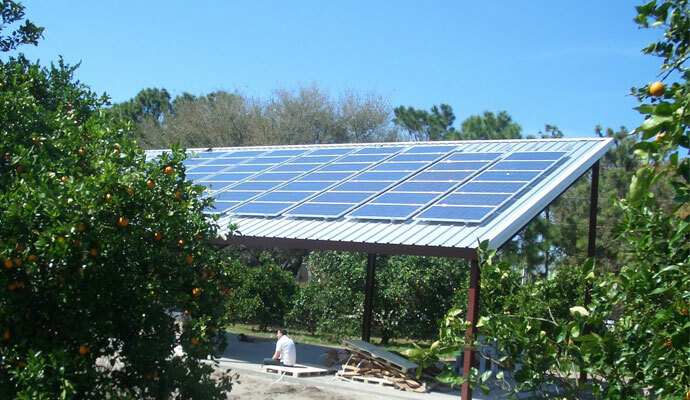 Because of this prohibition, Floridians are unable to access clean, homegrown energy sources such as solar. Floridians for Solar Choice launched a ballot initiative to allow consumers the option to power their homes or businesses with solar power. For more information on the Solar Choice initiative, please visit www.flsolarchoice.org. For the past several months, the Sierra Club has been actively working to help Floridians for Solar Choice collect enough petition signatures to place the solar initiative on the ballot. Sierra Club members and volunteers across Florida have been working to collect petition signatures of Club members and their friends, family, neighbors and co-workers. Because of you, Floridians for Solar Choice is about 80% of the way towards the required number of verified petition signatures. But the utilities have launched their own counter petition, called Consumers for Smart Solar in an effort to confuse voters. Utilities want to control the solar market and maintain the status quo when it comes to solar energy, and are using petition gatherers to confuse voters into signing their ballot initiative over the one we support. We have a short window to ensure the truly “smart” solar initiative makes the November ballot and we need your help in the final push to the finish line! Petition signatures must be verified by the Florida Division of Elections by February 1st, 2016 in order to make the November ballot. If you haven’t already, please visit http://www.flsolarchoice.org/sign-the-petition/ to download and sign the petition by December 31st. Once you’ve signed the petition ask five friends to sign it as well. Together, we can place this amendment on the ballot to expand renewable energy in the Sunshine State. To download the petition, click here. On November 28 and 29, Floridians joined people from all around the world, in more than 200 countries, to rally in support of the Paris talks to fight climate change. The talks ended in an agreement last week, which Sierra Club Executive Director Michael Brune called "a turning point for humanity." 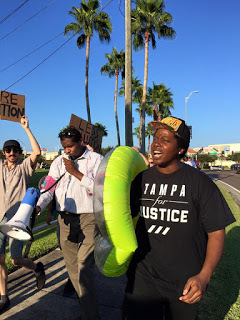 In the Tampa Bay area, hundreds of climate activists joined rallies in St. Petersburg and across the bay in Tampa. At the Tampa Rally, Andrew Rock, from the Tampa Bay Climate Action Network, asked that elected officials stop the partisanship and work together to solve the world's biggest crisis. Sierra Club's Tampa Bay Group Chair Kent Bailey said sea level rise is already affecting his boating experience on Tampa Bay. 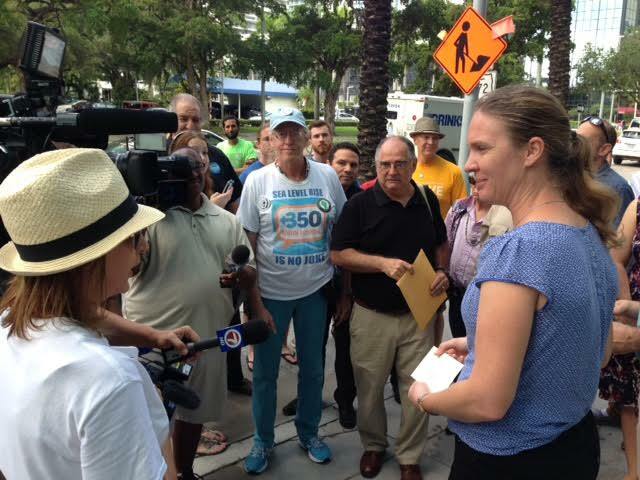 Dr. Lynn Ringenberg, Florida president of the Physicians for Social Responsibility, urged Florida leaders to create a strong Clean Power Plan to cut our carbon. urging strong global carbon reductions. In Miami, activists led by 350 South Florida marched over to the French Consulate on Brickell Avenue and presented a letter of support of the COP21 talks to Deputy Consul Karine Aumont. 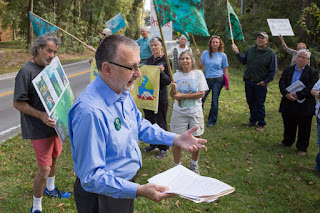 Sierra Club's Jonathan Ullman was quoted by WLRN saying he hoped that COP21 will lead to meaningful action. "We'd like to see a strong agreement...We'd like to see there be a set of commitments to reduce carbon, to achieve the levels scientists say are necessary to avoid a climate catastrophe." WFLA's coverage of the Tampa Rally. WLRN's coverage of the Miami Rally. Climate March, St. Petersburg, Florida from green thing on Vimeo. 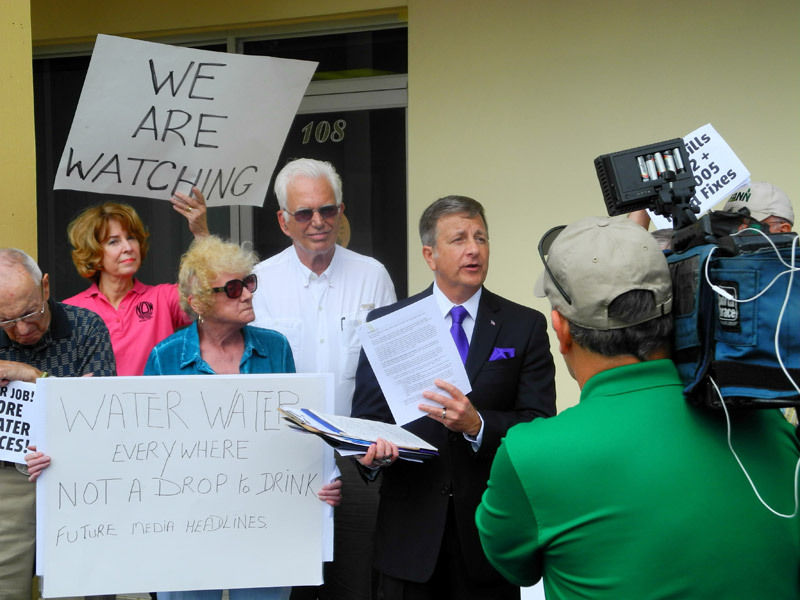 On December 9, at simultaneous press conferences, clean water activists representing Sierra Club and other Floridians’ Clean Water Declaration campaign coalition partners, delivered a letter signed by 106 organizations and businesses to Florida Senate President Andy Gardiner and House Speaker Steve Crisafulli, calling for real protection of the state’s imperiled waterways. The letter urges all of Florida’s state legislators to amend the 2016 water bills, SB 552 and HB 7005. These bills do not satisfy the needs of our waters and neglect many opportunities to create water policies that serve the public’s interest. Various regulated industries, agriculture, and their lobbyists are leading a retreat from protective policies and are instead relying on the same tools that have, for decades, failed Florida’s citizens and our waters. The letter suggests twelve key areas of concern, which can be remedied by amendments. 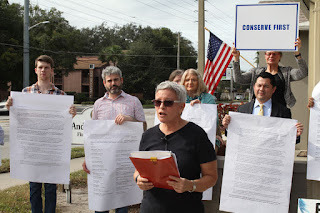 The Orlando crowd delivered a poster-sized copy of the letter, with all 106 signatures, to the senator’s aide and asked that Senate President Gardiner not only consider the list of concerns but also act to remedy them. In addition to the office visits, dozens of activists gathered in front of Glen Springs in Gainesville. "We're not being careful, we're not conserving, we're not being efficient in our use of water and our use of fertilizer," said Bob Knight, Director of the Howard T. Odum Florida Springs Institute. “Some parts of this legislation work against, not toward, water conservation and protection of groundwater and surface water” said Frank Jackalone, Sierra Club Senior Organizing Manager. "If we don't act as citizens right now, we're going to have a bill that controls the fate of our water supply and water quality for decades to come." 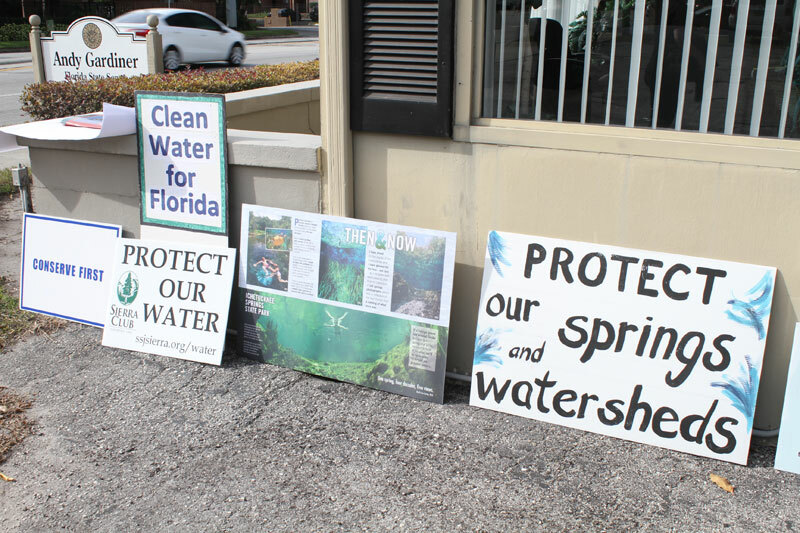 Signatories to the letter are calling for legislation that ensures conservation; long-term protection of Florida’s springs, rivers, estuaries and aquifers; and rapid restoration of imperiled waterways, because clean, plentiful water is the linchpin for Florida’s public, environmental, and economic health. Press coverage of the events and the letter included stories by The Gainesville Sun, Florida Today, and the Palm Beach Post; TV news stations Channel 20 (Gainesville) and Channel 9 (Orlando); and post-event editorials in The Gainesville Sun and the Ocala Star Banner. The Water Bills, SB 552 Environmental Resources by Sen. Dean and the companion bill, HB 7005 by Rep. Caldwell, are ready to go to the floor the first week of the legislative session that starts Tuesday, Jan. 12, 2016. Between now and then is our last chance to get these bills amended to do what they are supposed to do. Your State Representative and Senator will be in the home district from now until Friday, Jan. 8 and they need to hear from you via phone calls, emails and personal visits about how to improve the bills. 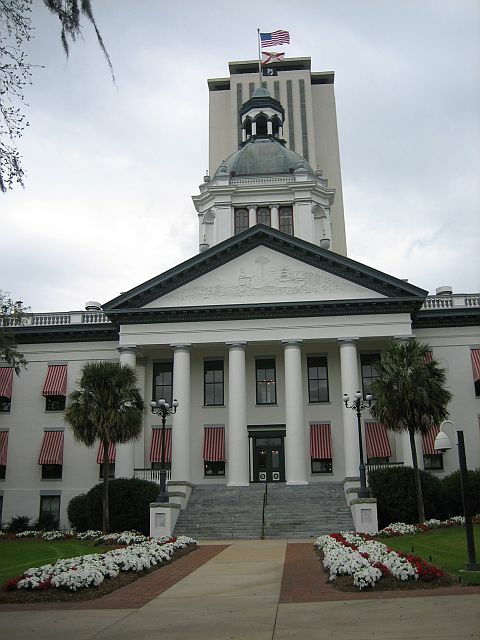 Familiarize your legislators and the members of your county’s legislative delegation with these amendments that address the deficiencies cited in the attached letter signed by 106 organizations and businesses (including Sierra Club Florida). The amendments are drafted to SB 552 and are listed in the order in which they will appear in the bill. Individual voters can take action to send the same message to their own legislators: Please consider submitting a letter-to-the-editor to your local newspaper urging your state representative and senator to give Florida the holiday gift it really needs - an amended water bill. Or urge legislators to make a New Year's resolution to amend the bill! Florida needs leadership on water issues and the choices our legislators make now will determine the future of our water resources – please add your voice to the call to get the water bills right! 3. Tell them to support these amendments to the bills. Print them out. 4. Write a letter to your local newspaper asking for stronger water bills and urging your legislators to support the amendments. Read this letter for talking points. You can also talk about a local water body you care about that is threatened by pollution. 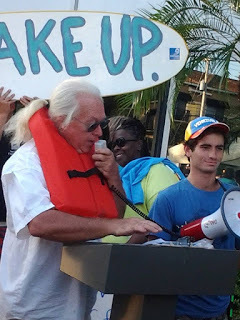 Click here for more photos and information on the Floridians’ Clean Water Declaration campaign. Sierra Club Florida has unveiled its 2016 Legislative Platform. The document is an important resource for groups and volunteers to use in their visits with legislators when explaining where Sierra Club Florida stands on issues. The full document can be seen and downloaded here. Your legislators will be in the district from December 5 through the first week of January. Make your appointments now! Changes in the 2016 Platform include urging that the intent of the voters who voted for Amendment 1 be faithfully implemented, support for completing the Florida Trail, appropriate regulation of the disposal of cigarette waste on our beaches, and revamping the Clean Energy section to include references to the state’s statutory energy goals in § 187.201 F.S. Sierra continues to advocate strongly for a comprehensive transition to a clean energy economy that abandons fossil fuels in favor of renewable energy sources and the implementation of energy efficiency. The platform forms the foundation for our lobbying in opposition to the anti-Clean Power Plan bills filed by Sen. Evers (SB 838) and Rep. Manny Diaz (HB 639) Carbon Dioxide Emissions from Existing Stationary Sources which would prohibit Florida from submitting a State Implementation Plan (SIP) to the Environmental Protection Agency or acceding to any rules to reduce CO2 required under the CPP until either Congress specifically enacts the provisions or a federal court issues a final judgment stating the rules are legal. It is also the basis for our support of a proposed Constitutional amendment and a linked implementing bill to extend the current exemption from ad valorem taxation for residential properties to non-residential properties as well (SJR 170 and SB 172 by Sen. Brandes and HJR 193 and HB 195 by Rep. Ray Rodrigues, Renewable Energy Source Device.) The passage of the implementing bill means the exemption from real estate taxes on the value of solar panels would go into effect immediately on the adoption of the constitutional amendment by the voters instead of having to wait for the legislature to pass an implementing bill as happened with the residential exemption which was adopted by the voters in 2008 but not implemented until 2013. The new platform also adds ‘acid fracturing’ and ‘acid matrix stimulations’ to fracking as procedures the Club supports banning. 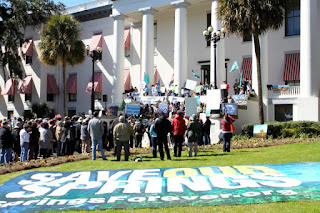 The Club supports HB 19 by Rep. Jenne and SB 166 by Sen. Soto which call for a statutory ban on all fracking techniques in Florida. We also support SJR 358 by Sen. Ring and HJR 453 by Rep. Javier Rodriguez that propose a Constitutional amendment to ban the practice. Finally, we support Sen. Sobel’s Senate resolution expressing the support of the Florida Senate for a state ban on fracking. The Club opposes this year’s HB 191 by Rep. Ray Rodrigues and SB 318 by Sen. Richter which exclude acid treatments from the definition of “high-pressure well stimulation” and thereby exclude them from any new regulation under the bill even though they are the treatments most likely to be used in Florida’s limestone and dolomite geology. Worse, 191 and 318 preempt local control of all well stimulation treatments (including acidization - as well as anything to do with oil and gas development) and will prevent cities and counties from protecting their residents from the injection of toxic chemicals into the ground beneath their feet.) The bills also provide that the Uniform Trade Secrets Act (Chapter 688 F.S.) will apply to any disclosure of the chemicals used to prevent citizens from finding out exactly what chemicals they and their families may be exposed to. 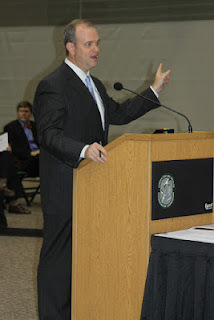 This year’s platform also emphasizes issues surrounding Electric Vehicles that we hope to have legislative success with this session: enforcement of civil penalties for non-electric vehicles that park in EV charging stations, sales tax exemption for plug-in EVs, EV charging stations at multi-unit dwellings, rapid charging stations across Florida’s public roads, and increasing statewide electric vehicle fleets. Sen. Soto has filed SB 364, which the Sierra Club and Drive Electric Florida has worked with the senator to amend. The bill will provide a sales tax exemption for the purchase of plug-in electric vehicles and hydrogen cars, capped at the first $40,000 of the sales price of each vehicle. The bill defines plug-in electric vehicles to include both electric vehicles, such as the Nissan Leaf and the Tesla Model S, as well as extended range electric vehicles such as the Chevrolet Volt. The Sierra Club supports this good bill. We continue to support a ban on plastic bags such as Sen. Bullard’s SB 306 and Rep. Richardson’s HB 143 that would permit a pilot program allowing coastal communities with a population of fewer than 100,000 to regulate or ban disposable bags. The bills provide that the localities must collect data on the results of the regulation or ban and report to DEP. To read the full Sierra Club 2016 Legislative Platform, click here. TALLAHASSEE - On behalf of the Sierra Club, Earthjustice filed a legal action today asking the U.S. Environmental Protection Agency to regulate smoke pollution coming from thousands of acres of sugar cane that U.S. Sugar Corp. burns in South Florida each year. Burning the cane causes hazardous air pollution that poses a health risk to people. The petition asks the EPA to veto a permit that the Florida Department of Environmental Protection issued to U.S. Sugar. The permit should be vetoed because it only regulates the smokestacks at a sugar refinery industrial plant, but doesn’t regulate the clouds of billowing black smoke coming off 150,000 acres of burning sugar cane each year. Records show that sugar cane burning in Glades, Hendry, and Palm Beach counties emits over 2,800 tons of hazardous air pollutants per year. The burning accounts for 86 percent of Palm Beach County’s emissions of formaldehyde, a probable carcinogen, and 69 percent of emissions of toxic acenaphthylene, a pollutant linked to genetic mutations and cancer. 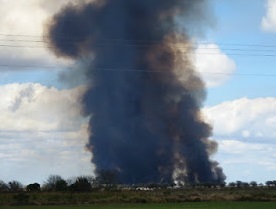 Sugar growers burn fields to remove excess leaves around cane stalks before harvesting. In some parts of Brazil and Australia, sugar growers have shifted to a greener approach; they cut away the leafy parts of sugar cane and use it to mulch fields. Sugar growers could also use the leafy cuttings as biofuel in processing plants that (unlike the open fields) have pollution control equipment. After years of inaction, new legislation to stem declining water quality in springs, rivers, estuaries and aquifers has fallen short. The 2016 water bills, SB 552 and HB 7005, rely on failed methods that have produced decades of polluted water. In response, the Floridians' Clean Water Declaration (FCWD) has drafted a sign-on letter to urge the Florida Senate and House of Representatives to enact legislation that ensures conservation, rapid restoration and long-term protection of our waterways and aquifers. The FCWD, led by representatives from 17 different water advocacy organizations, is an ad-hoc coalition to protect water quality and quantity in Florida. It organized large clean water rallies in Tallahassee in 2014 and 2015. Help us expand the list of organizations and businesses (52) that have already signed the letter. We will send the letter to the Senate President, House Speaker, and every other Florida Senator and Representative. We will also use it to engage a wider public in the fight to win clean water for Florida. These faulty water bills are on on a fast-track to be debated on the Senate and House floors in the first week of the session starting January 12, 2016. We need to put pressure on lawmakers to amend these bills. Read these stories (Miami Herald and The Gainesville Sun) about the proposed legislation, which point out the mad dash it is taking. 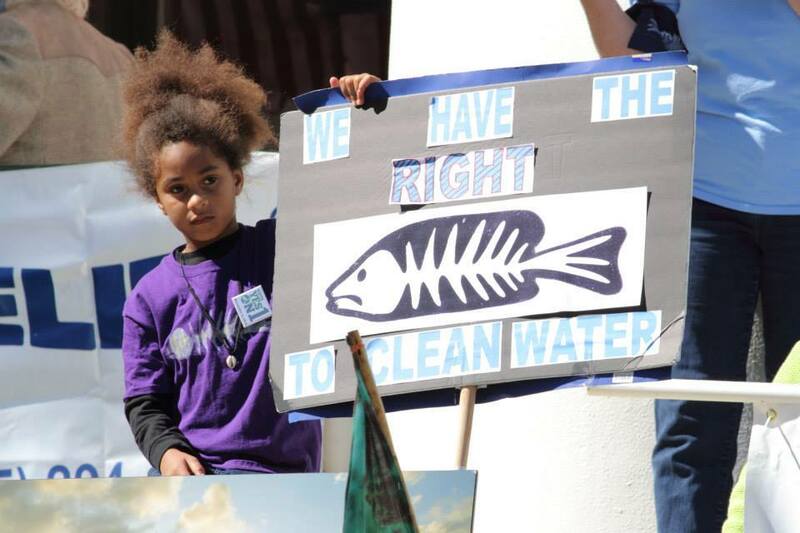 United we can protect Florida's water. Many Sierra Club members consider State Parks to be the centerpiece of DEP's responsibilities. The mission of the Florida Park Service, a key part of the Department of Environment Protection and the responsibility of its Secretary, foremost is to protect and manage our 171 state parks and trails for the recreational enjoyment of Florida's residents and our children. Sadly, Jon Steverson has a much different mission. He would subvert the fundamental purpose of managing our state parks for the enjoyment of all citizens to one of economic development for the few. 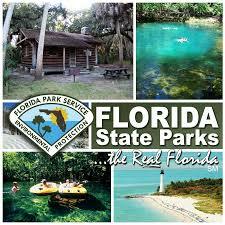 Floridians do not want hunting, cattle grazing or timber harvesting in their state parks. They want parks to be managed as parks. The Senate should reject Governor Scott's nomination of Jon Steverson. We urge you to ask the Governor to conduct a new search, and then send you a nominee who promises to serve Florida as a champion for the state parks and the wildlife they contain. Note: The Committee voted to confirm Steverson. Sierra Club Florida will continue to oppose the nomination as it moves to a Senate Floor vote. 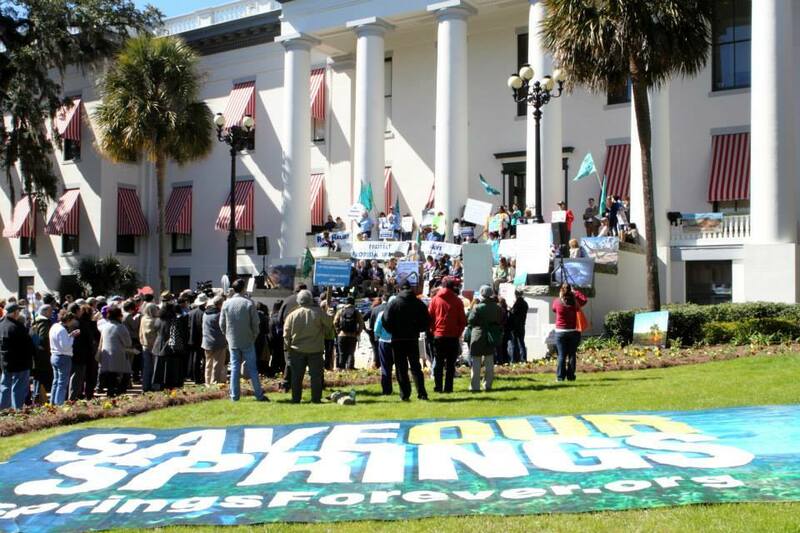 A bill that would pave the way for fracking in Florida passed a House Subcommittee last week. HB 191 Regulation of Oil and Gas by Rep. Ray Rodrigues (R-Estero) passed the House Agriculture and Natural Resources Subcommittee 9-4 on Tuesday, Nov. 3, despite 39 speakers representing at least 15 organizations opposing the bill. Organizations against the bill included the Florida AFL-CIO, Sierra Club Florida, ReThink Energy, the Florida Federation of Garden Clubs, and Physicians for Social Responsibility. The only supporters of the bill were the Florida Petroleum Council, the Chamber of Commerce, and Associated Industries of Florida. These members (all Democrats) voted NO on the bill and deserve a thank you call! Please contact them and let them know you appreciate their standing up for you. All nine Republicans on the committee voted for the bill. HB 191 next goes to the Appropriations Subcommittee on Agriculture and Natural Resources followed by the State Affairs Committee. Watch for alerts to know when to contact the members of those committees. The Senate companion, SB 318 by Sen. Richter (Collier and Lee) has not been heard in committee yet but we expect it to come up soon, so please watch for alerts on that bill too. The breadth of opposition to the bill reflects how bad it is. Not only does it preempt local communities from adopting or enforcing regulations - including zoning - that interfere with anything to do with oil and gas (not just fracking), it also uses a definition that excludes acid fracking techniques which are most likely to be used in Florida because of our limestone and dolomite geology. Therefore, the bill exempts acid treatments from any new regulation - there’s none in the bill and none will be allowed by local governments. 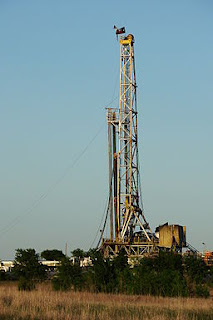 Click here for a News Service of Florida article about the fracking vote. On Wednesday, November 4, the owner of a St. Petersburg-based electric boat company, Nancy Frainetti, and her sister Paula Frainetti completed a nine-day, 360-mile trip in an all-electric, solar powered boat up the length of Florida’s Atlantic Coast in a "Voyage of Hope." The purpose was to raise awareness and funds for breast cancer support services of The Donna Foundation, which serves the critical needs of First Coast women living with breast cancer within a 16-county area of Jacksonville. Nancy Frainetti sells electric, solar powered boats at the Electric Marina in St. Petersburg. Her company was a sponsor of and exhibitor at St. Pete Drive Electric Day, and her electric boat served as the float for the Suncoast Sierra Club's entry in last June's Pride Parade on Central Ave., the location of Sierra Club's state office. You can learn more about the Voyage of Hope here, in this news story, and on the Electric Marina's Facebook page. Contributions to The Donna Foundation may still be made through the Voyage of Hope. Sierra Club Florida members took to the streets for People's Climate marches and events in Tampa, Miami, Orlando, Gainesville and St. Augustine, joining 200 cities across the country on October 14. The marches were a follow-up to the People's Climate March in New York City, which attracted hundreds of thousands last year. This year's marches served as an important springboard to the Paris Climate talks later this year. Senator Marco Rubio’s Tampa office is just barely above sea level, which is why Sierra Club members, along with several dozen other allies, showed up to his office. More than 100 people donned life jackets in keeping with the theme "the Rising Tide," both in the rising sea due to climate change, but also in the demand for action on climate by our leaders. Speakers from labor, public health professionals and the Sierra Club called out Rubio on being a climate denier and demanded action. Working with allies like Physicians for Social Responsibility, Environment Florida, Service Employees International Union and AFL-CIO, the crowd and speakers represented the diversity of the Tampa Bay area and the concerns we all share in action on climate change. Afterwards, marchers came together at SEIU 1199’s office for an ice cream social, hosted by Ben and Jerry’s. More than 40 people came to get their free scoop of ice cream and to support Ben and Jerry’s climate tour. 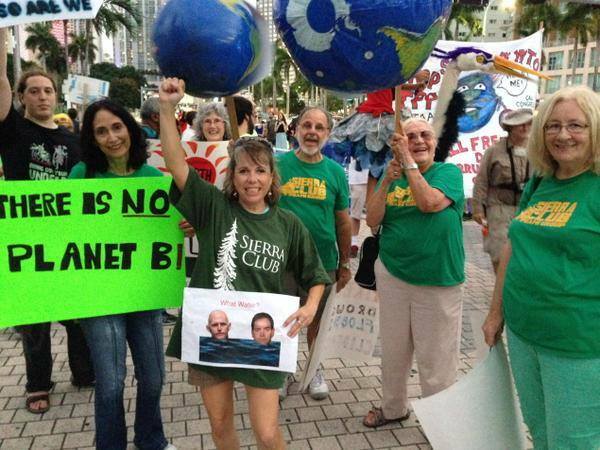 Dozens of Sierra Club members across South Florida took part in the Miami Climate March attended by 1,200 people. Members came from Palm Beach, Broward and Miami-Dade counties, wearing Sierra Club t-shirts and carrying banners about the Everglades. They held a giant globe and signs as the march wound through downtown during rush hour from County Hall to to the Torch of Friendship monument a mile away. Watch Orlando March: click here. It’s the beginning of the end of the era of dirty diesel as Pinellas County's transit board recognizes that the future of transit is electric. 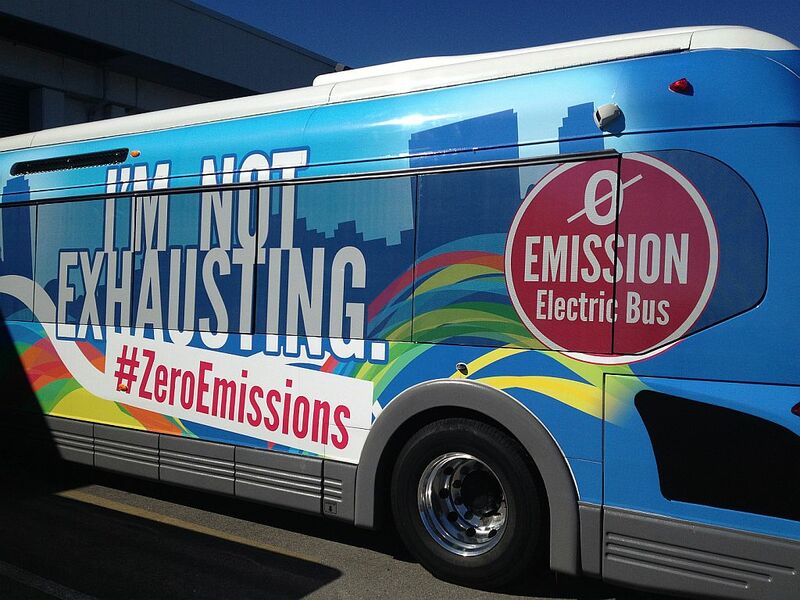 With 35 Pinellas residents wearing bright green stickers that read: Zero Emission Buses NOW! We Can’t Afford NOT To!”, a polar shift from diesel to zero emission electric buses took place Wednesday, October 28, at the Pinellas Suncoast Transit Authority’s (PSTA) board meeting. Although the board voted 8-7 to buy seven new diesel hybrid buses, it also voted unanimously for a six-month study of electric buses. Several board members stated that a shift to electric buses is the future of transit in Pinellas County, a densely populated coastal community that is at risk for more economic damage from climate change than any other in Florida. The polar shift from diesel to electric that occurred in the past two months was a result of Sierra Club’s intensive public engagement campaign. Sierra Club staff and activists met with the majority of board members prior to the board meeting. As a direct result of Sierra Club advocacy, the new plan to purchase diesel-only buses has been scrapped. The PSTA board also directed staff to begin work with Proterra, the nation’s leading bus manufacturer, to develop a “Lo-No” federal grant application to buy 6-10 electric buses. The grant application, which will face stiff competition from numerous transit agencies across the U.S., is due November 23. Sierra Club pledged to work to build support in the community that would be served by the Proterra buses. Pinellas County’s new interest in electric buses is not unique. Tallahassee’s StarMetro agency has been operating 5 of Proterra’s electric buses for the past 3 years, and now other Florida transit agencies are also looking into how these new buses can help any agency meet its goals to reduce expenses and emissions. BYD, a global leader in electric buses based in China, demonstrated its bus for PSTA on September 14 after appearing at Sierra Club’s St. Pete Drive Electric Day EVent. While PSTA declined BYD’s’s offer to let the agency test its bus on routes for a week, that offer was accepted last month by Miami-Dade Mayor Carlos Gimenez. In addition to Pinellas and Miami-Dade, Orange and Alachua counties are now also seriously considering adding zero emission buses to their fleets. Florida State University, whose students have been riding electric buses for years across Tallahassee, is considering buying its own for campus transport. Orlando theme parks Disney and Universal are also in the market for electric buses to whisk their visitors between attractions. The electric buses would replace diesel buses that, while they provide a convenient service that allows tourists to park their cars for days during their stay, create an unhealthy situation for families with children with asthma forced to breathe diesel fumes as they wait to catch a bus. Opposition to the first black bear hunt in 21 years sparks protests across the state. Commission in downtown St. Petersburg made local and national news. Despite a widely supported legal battle, statewide protests, and condemnation by editorial boards and community leaders, the first sanctioned Florida Black Bear hunt in 21 years ended after two days with the deaths of 298 reported bears. The number of unreported killings is unknown. 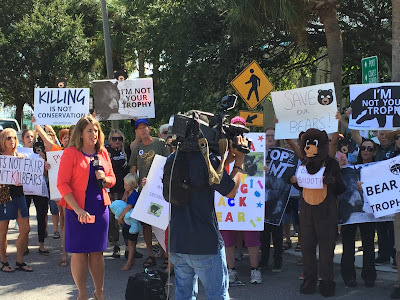 After months of hearings and debate, the one-week hunt was approved by the Florida Fish and Wildlife Conservation Commission (FWC) in an attempt to cull what the FWC considered an overpopulation of the black bear in certain areas of the state. A legal filing by Speak Up Wekiva which was supported by Sierra Club Florida aimed to stop the hunt but failed. The Florida black bear was removed from the threatened species list in 2012. An increase in reportings of “nuisance” bears and an unscientific guesstimate of current population (around 3,000) led the FWC to call for a hunt. The state sold 3,778 bear hunting permits, more than one hunter per bear in the state. Sierra activism began earlier this year when the FWC held public workshops in Tallahassee, Sarasota and Fort Lauderdale. 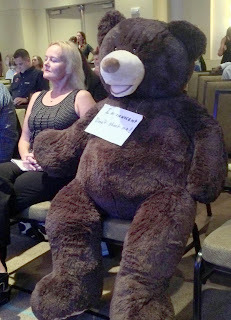 Members and supporters packed the hearings to voice stern opposition to the scientific need for a hunt, instead urging the commission to address the human behaviors (waste management) that are leading bears to trash cans and backyards. Days prior to the hunt, Sierra Club groups unified with other supporters in a dozen rallies across the state to protest the hunt. Members joined forces in Jacksonville, West Palm Beach, Sarasota, Gainesville, Orlando, Miami, Tampa and Petersburg, among other cities. The FWC says it plans to hold the hunt annually. during an FWC public hearing before the vote. In a guest column in the Tampa Bay Times, conservation photojournalist Carlton Ward Jr., a leader in the Florida Wildlife Corridor Project, expressed concern for the long-term survival of the Florida black bear if unrelenting development continues. He calls for the immediate use of $500 million in Amendment 1 funds to go toward land conservation, targeting wildlife corridors for bear subpopulations and easements for working farms and ranches. “I hope that the bears that died … will capture our attention and send us down a path to connect a statewide network of conservation lands for the future of their species and ours,” he said in his commentary. HB 191 - Regulation of Oil and Gas by Rep. Ray Rodrigues, will be heard in the House Agriculture and Natural Resources Subcommittee next Tuesday, November 3 at noon. Please contact the members of the committee to urge them to vote NO on this bill. Also, contact your personal Representative and Senator and urge them to stop the bills permitting fracking. Committee member contact information is below. Fracking imposes unnecessary and unacceptable risks on the residents of Florida. The tremendous use of water that is forever lost due to contamination, the risk of contaminating our aquifers, and the continuing contribution of greenhouse gases to the atmosphere posed by fracking and burning natural gas is unconscionable when energy efficiency and renewable energy offer a clean and safe alternative. Completely preempts anything to do with oil or gas to the state, including: exploration, development, production, processing, storage, or transportation. The preemption would apply to existing ordinances as well as prohibiting the adoption of new ones. Designates FracFocus as the official chemical disclosure registry while preventing citizens from knowing what is being injected into the ground beneath their feet by use of the Uniform Trade Secrets Act. Backers of the bill tout it as being a moratorium (a delay before fracking permits are issued.) Permits won’t be issued right away, but they will be issued as soon as the rulemaking process is complete. And all of the other bad policy in the bill will be effective immediately. 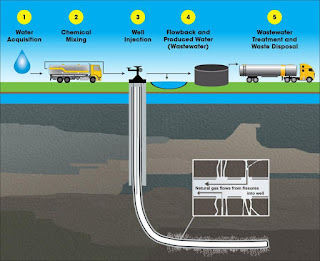 The preemption, the vulnerability of cities that oil/gas operators may want to drill in, and of course, the definition of “high-pressure well stimulation” that excludes the most likely methods of fracking for Florida from new regulation will all take effect on Day One. No new regulations or permitting will be put in place for acid fracturing or acid matrix stimulation and the potential for contamination will occur regardless of whether or not “high-pressure well stimulations” permits are being issued. The broad preemption language will prevent localities from doing anything about it, and the Trade Secrets provision will prevent residents from finding out what toxic chemicals they may be exposed to. The bill calls for a study, but only of “high-pressure well stimulation.” And there is no provision for delay or a change in direction if the study turns up a threat to public health - fracking permits get issued when rulemaking is complete. One peer-reviewed study and one university report have presented data indicating statistical associations between some birth outcomes (low birth weight and some congenital defects) and residential proximity of the mother to well pads during pregnancy (Hill, 2012; McKenzie, 2014). Proximity to higher-density HVHF well pad development was associated with increased incidence of congenital heart defects and neural-tube defects in one of the studies (McKenzie, 2014). 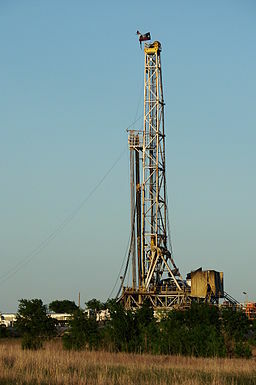 SJR 0358 Hydraulic Fracturing by Sen. Ring has been referred to Environmental Preservation and Conservation; Judiciary; Rules. HJR 0453 Well Stimulation by Rep. Rodriguez (with a ‘z’) but has not yet been referred to committees. SB 0318 Regulation of Oil and Gas Resources by Sen. Richter has been referred to Environmental Preservation and Conservation; Appropriations Subcommittee on General Government; Appropriations. This year the pro-fracking sponsors have not filed separate ‘trade secrets’ bills and are relying on the process already in statute in Chapter 688 to protect them from having to disclose what toxic chemicals they are injecting into the ground.